If you are only using Universalhunt.com as a business card, an e-mail replacement, or some kind of counterpart for business contacts, you are missing out on its recruitment potential. Whatever industry or sector your company is into, there should be always something about the business that makes you stand out from the crowd. Think about culture, work environment, vision & mission, etc. As a company what will make you the company of choice to your target audience? Making this as a starting point of any Universalhunt.com hiring strategy; only by truly understanding your target audience can you start to craft your recruitment messaging and profile pages on Universalhunt.com to attract your ideal professional. Now you know what sets you aside from all of your competitors, along with what makes you a company of choice for your prospective professionals, the hard work begins now. This is your chance to engage with your current as well as new potential ones. Your company page will be the first point of contact for everyone who are searching your company page on Universalhunt.com. So it should address about who your company is and what business it does. A Supportive engagement with your current employees on the company page will in turn promote it to their networks. This hugely enhances your outreach, broadening your net for your potential candidates. So make sure they have your company mentioned as their current employer; as it will automatically make them a follower of your company page. This will show everyone your employees’ investment in the company; since it is very important, particularly within a larger organization. Once you start interacting on the company page, not just professionals but also your competitors and partners who are interested in investing are likely to click through to your page. So a professional photo and a descriptive headline will initially draw everyone’s attention. With over a million users, Universalhunt.com has been making great strides to offer better tools for searching and posting jobs. 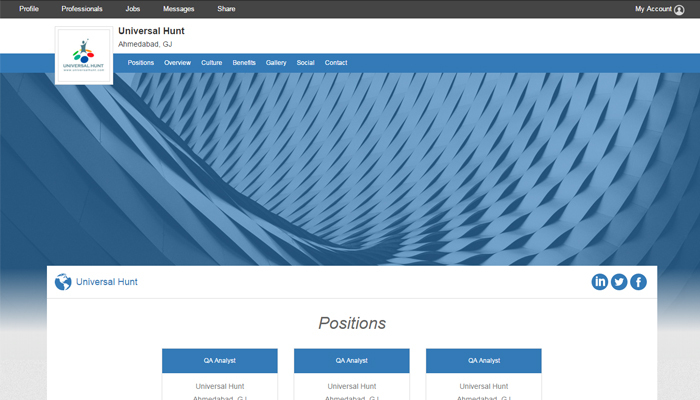 Universalhunt.com continues to emerge with more features, and will undoubtedly become a major source for finding e best talent in the years to come.